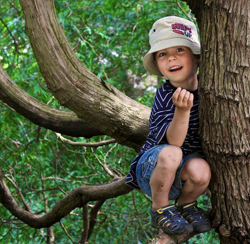 Would you let your kid climb a tree? What about jump off a roof? We didn't just hang upside down on the monkey bars, we used to play "tag" and run across them like it was nothing. I don't think I could even step on one of them today - amazing how fearless children are! Jumping roofs! Dangerous but fun. We jumped from house to house. In LA, they are built very close. Jumping off the roof of a ranch house garage into a pile of leaves. Um... climbing high into trees and jumping down... (we thought we could fly!). Falling out of trees. Luckily I was a bouncy kid. Riding my brother's bike down the hill. It was too big for me. I couldn't reach the pedals. I had to get off by riding onto the grass and going in a slow circle until it fell down. Walking the rail on the railroad tracks. Who knew we were developing and training balance. We were having FUN! Running the gauntlet through the swings that my friends were swinging on. The best part of it was *almost* getting kicked, narrowly escaping! Biking down the long, steep hill in front of my house (age 6), no hands, no feet, no helmet and screaming my head off in glee. What was your favorite "dangerous" playtime activity growing up?